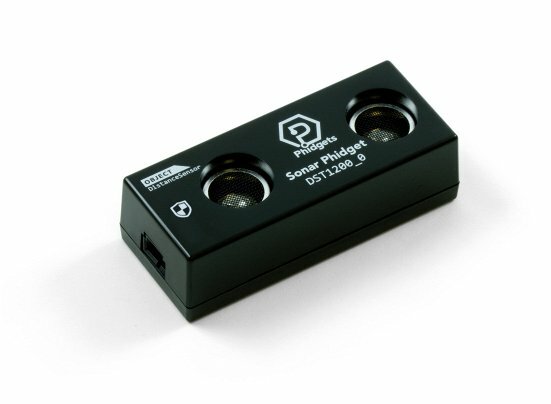 For applications of spatial awareness and motion sensing, this handy Sonar Phidget is unmatched. It emits pulses of ultrasonic vibration at a rate of up to 10 pulses per second. After each pulse, it "listens" for ultrasonic waves that have reflected off of objects up to 10m away and sends them to your computer via the sensor update event. 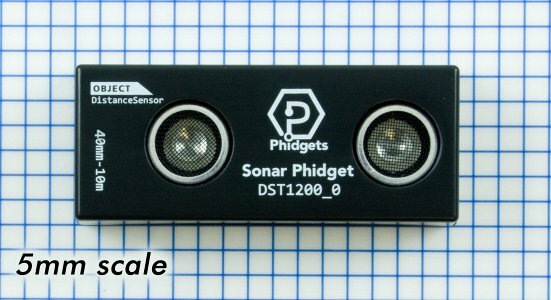 The Sonar Phidget can detect up to 8 reflections in a single pulse, and will report the approximate distance and strength of each reflected wave. The DST1200 connects to a port on a VINT Hub. See the Connection & Compatibility tab for a list of hubs. The Sonar Phidget can be used as an ultrasonic range finder. The distanceChange event automatically returns the distance of the strongest reflection whenever new data comes in. This mode is commonly used for obstacle detection in robotics projects. 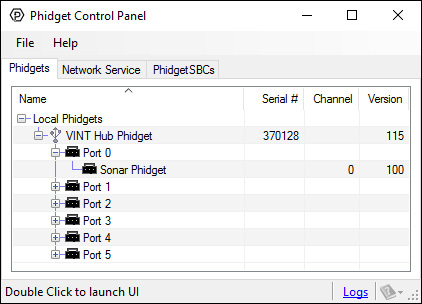 Connect the DST1200 to the VINT Hub using the Phidget cable. Now that you have everything together, let's start using the DST1200! In order to demonstrate the functionality of the DST1200, the Phidget Control Panel running on a Windows machine will be used. Linux users can follow the getting started with Linux guide and continue reading here for more information about the DST1200. Toggle the Quiet Mode with the checkbox. For more information on Quiet Mode, check out the technical section. The distance (mm) of the strongest reflection will be shown in the Data box. 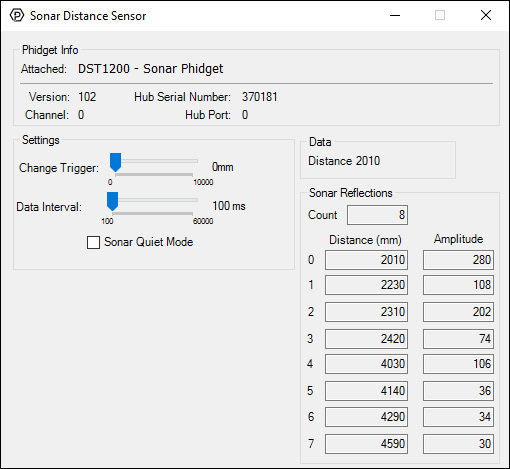 All other reflections (distance and amplitude) can be seen in the Sonar Reflections box. These additional reflections can correspond to other objects, or echoes of the primary object. 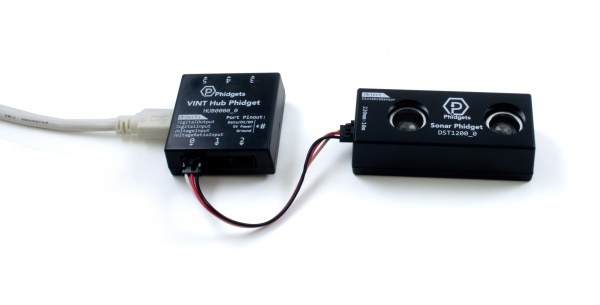 This Phidget is compatible with the DistanceSensor Examples. The DST1200 has a Quiet Mode property which, as the name suggests, reduces the volume of the sound pulses used by the sonar sensors. While the sound that this Phidget makes is audible in either mode, it is much more noticeable without quiet mode enabled. By enabling quiet mode, you will affect the maximum sensing range and the number of reflections detected. Quiet mode also consumes less power, as explained in the next section. The current consumption of the DST1200 varies depending on the data interval you choose. The longer the interval between samples, the lower the current consumption. Switching to quiet mode also lowers current consumption slightly. When you receive data from the DST1200, you'll end up with an array of sonar reflections that each have a distance and an amplitude. The distance, of course, refers to how far away the object is. The amplitude gives you a general idea of the size of the object. The amplitude value can range from 3 to approximately 900, with 3 being a very small reflection and 900 being a very large one. In some applications, you'll want to ignore reflections with an amplitude you deem is too small. The DST1200 will fire saturation error events when the nearest reflection is closer that 40mm from the sensor. At this range it is too close for the sensor to accurately determine the range of the object. * - Current consumption varies depending on the selected data interval and whether or not it is running in "quiet" mode. See the technical section of the User Guide for details. Errata: The enclosure for the DST1200 may state the range as being 220mm to 10m, but it is actually 40mm to 10m, as listed in the specification table.